If you are looking to migrate to Canada, then this is the right time for you! Starting from the year 2019, Canada has a new three-year immigration levels plan. The plan is to facilitate the immigration of around 1 million to immigrants to Canada by the year 2021. This seems totally possible by the immigration friendly country, especially looking at their immigration numbers in recent times. In 2018, about 3, 10, 000 people received Canadian PR (increased job vacancies and record migration in 2018). In January 2019, Canada sent invitations to more than 40,000 potential applicants to apply for permanent residency through the economic immigration and family sponsorship programs. So why does Canada want a million immigrants by 2021? And how can you apply for a Canadian PR? Let’s take a look. In an earlier post, we had talked about the extension of the Multi-Year immigration Plan by the Canadian Immigration Department. 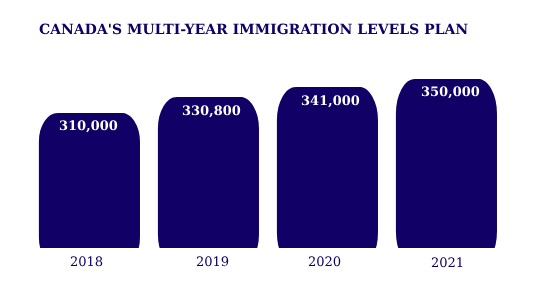 The total intake of immigrants for the years 2019 to 2021 has been increased from previously planned levels. The planned intake of immigrants every year is now almost 1% of the total Canadian population! The government there estimates that a 1% immigration rate per year is essential for the sustained growth of the Canadian Labour force and economy. This is the reason why Canada wants a million immigrants by 2021. If you are looking to migrate to Canada through this opportunity then the main immigration programs of interest are the Express Entry Program and Provincial Nominee Program (PNP). These are the main major avenues of new immigrants to Canada. Canada’s Express Entry Program is the country’s main source of skilled foreign labor and residency applications from an immigration ready workforce. The month of January saw the biggest start ever to the Express Entry Program, with PR invitations to over 11,150 candidates. This came just as 2018 concluded with the most invitations to apply for Canada Permanent Residence, over 89,800 invitations. This is the highest in the 5-year history of the Express Entry Program. Now that Canada’s immigration plans have become even more ambitious, you can expect further records to be set in the coming years. A point to note is that under the Express Entry Program, all Candidates are evaluated using a Comprehensive Ranking System (CRS) which factors in age, work history, education, and language proficiency (either in English or French). Only the eligible candidates from CRS are then sent invites for applying to a permanent Canada Residency. The Provincial Nominee Program or PNP is another immigration program that invited a major chunk of Canada PR applications in January, nearly 5,000 candidates. The Provincial Nominee Program enables the provinces and territories of Canada, participating in the program, to nominate a set number of economic immigration candidates for permanent residence. This set number of PNP invitations will be increased further in 2019, 2020 and 2021 as per the current trend. The 5000 invitations came from programs in Ontario, Manitoba, Saskatchewan, Prince Edward Island, British Columbia, and Nova Scotia. Apart from the Express Entry and PNP, Canada has re-opened another interesting immigration avenue, the Parents and Grandparents Program. As per the Parents and Grandparents Program, Canada PR Holders and citizens above the age of 18 can sponsor their parents or grandparents for permanent residence in Canada. Fill the Interest to Sponsor form made available by the IRCC (Immigration, Refugees and Citizenship Canada department). It follows a first-in, first-served system. On January 28, the IRCC released the Interest to Sponsor form with a target of receiving 27,000 expressions of Interest for PGP. They achieved this target within just a few minutes of the re-opening of the program! The second step is from the IRCC. They’ll be inviting eligible candidates for PGP from the pool of applicants. As we mentioned earlier, the IRCC will be following the first-in, first served system wherein they will issue invitations in the order the Interest to Sponsor forms were received. “January saw 40,000 invitations for PR from Canada and this is pretty exciting. The numbers are only going to go up in the coming years until Canada meets its 1 million immigrant’s goal by 2021. Our team processed a big rush of immigration applications by January itself. We are geared to help more people achieve their Canadian immigration dream” said Pelican migration Consultants ICCRC lawyer. 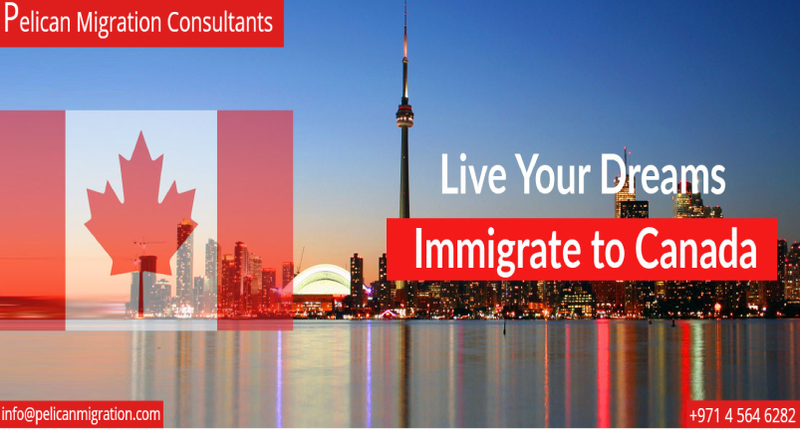 Pelican migration Consultants can help you with your Canada Immigration application. Our expert consultants can help with all the a to z tasks related to immigration such as application preparation and submission, procuring required documents and coordinating with the immigration office on behalf of you. For any queries related to Canada Immigration you please feel free to send a mail to info@pelicanmigration.com. You’ll receive prompt replies.